Heat exchangers are used all over the world day in day out not only for chemical and thermal processes – but also for their reverse application, air conditioning units. 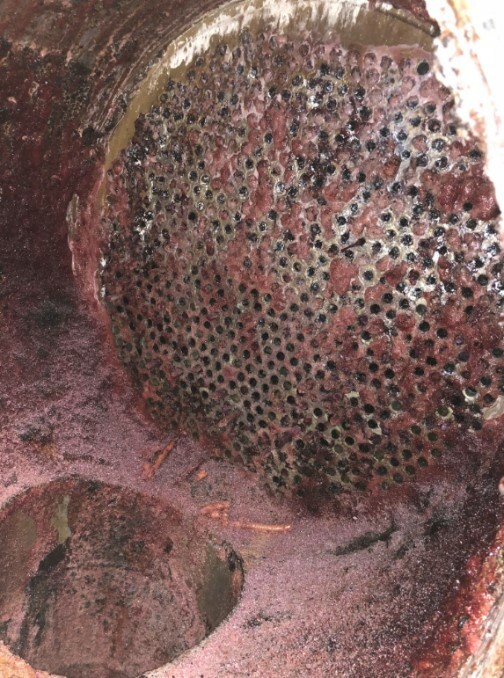 Due to the heat exchangers being such a big part of many businesses’ operation, it’s important to keep them clean and functioning to their maximum potential. 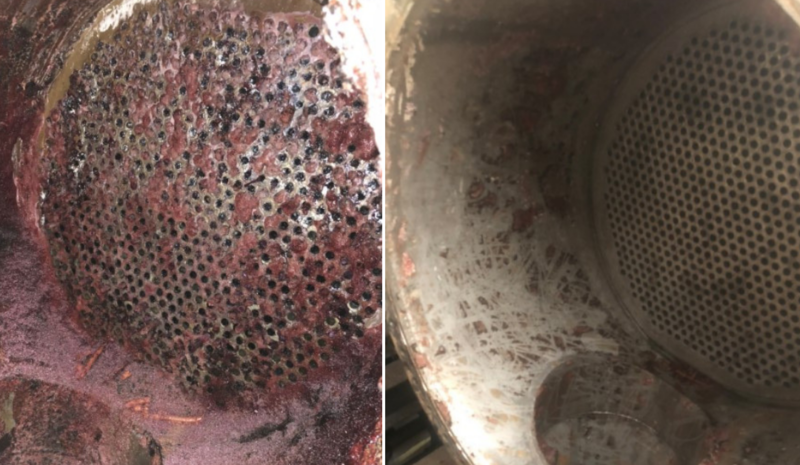 Recently, one of our customers called upon Hydroblast to clean some residue that had built up in their exchanger. Hydroblast were able to clean the blocked bundle in 1 ½ days using one of our latest Hammelmann Aqua 14 units which develops maximum pressures and flows of 2800 bar and 30 lpm. 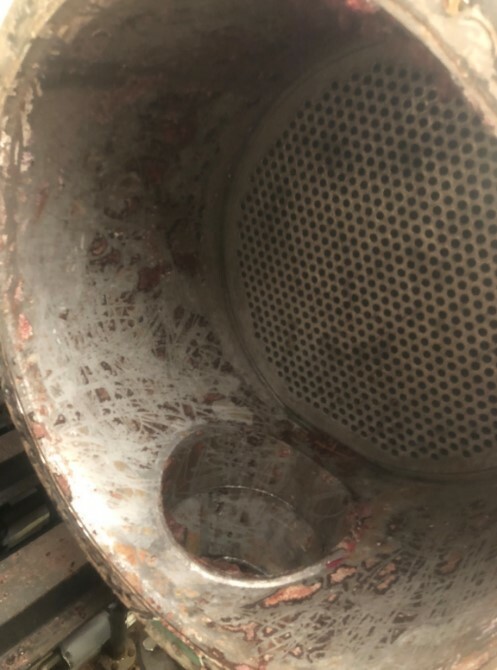 The exchanger was cleaned using 2800 bar @ 26 lpm using one of our tube cleaning nozzles specifically designed for cleaning heat exchangers effectively removing hard scale deposits such as resins/polymers and carbons. Not only does it unplug the blockage but we are able to polish the tubes which allows the exchanger to run at much more efficiency. The speed and efficiency was achieved keeping in line with Hydroblast’s philosophy of automation using a single lance tube cleaner XL, which gives excellent cleaning results due to the consistent speed and front and back cleaning of the tube. This is also very important for the safety of the operator as not only does it provide excellent back out prevention of the high pressure hose due to the hose being contained in friction blocks, it put less fatigue on the operator having to manually work the hose in and out of each tube. The single lance cleaner is lightweight and is driven by air that the operator can control the speed how quickly it goes in and out of the tube. All of our technicians and operators are trained to highest standards, and experienced in petrochemical and manufacturing industries. 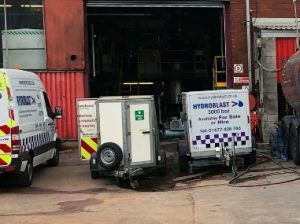 Hydroblast are members of the water jetting association and can also offer water jetting training. The ultra high pressure unit was operated using an electronic stop start meaning the operator is in full control of when the machine pressure is activated. This remote also has a remote e-stop as an additionally safety feature. There is only one logical step to take if your heat exchanger needs a clean, and that is to use High Pressure Water Jetting. 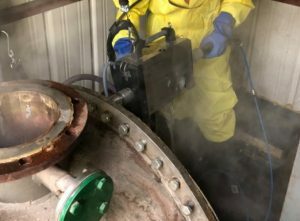 This process removes the need to use chemicals, which in turn could cause further damage to the exchanger by weakening or destroying the material, therefore leading to unnecessary costs. The parameters for cleaning are very variable depending on what material you are cleaning including water pressure, flow of and temperature of water, size and configuration of the nozzle meaning this method of cleaning is economic. Depending on the size of the bundle our automated methods allows up to 5 tubes being cleaned in one pass if a multi lance system is used, and can clean vertical tubes not just horizontal.